This is the Hoffman AB763 board kit that has had cathode and grid resistors added to the power section to support four output tubes. I call this the AB763x4 board. This board is a good replacement for the "reissue" amps, or to "roll your own" if you can build the chassis, cabinet, etc. Note: This board is mainly to replace the old AB763 circuits which had four output tubes, or for those who want to build their own, and just can't seem to get enough power from two 6L6's or two 6V6's. 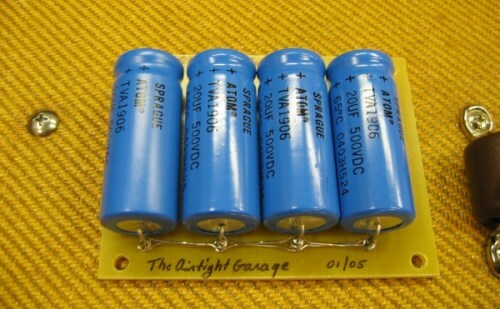 The picture of the AB763x4 shown here has a "half upgrade" in that the front end capacitors have been upgraded. If you would like a full upgrade select it as an option below, or if you would like just a front end upgrade, email or call.